Eslaforde Park Bowls Club’s annual President’s Day competition was held at the Boston Road green on Sunday with a full contingent of players taking part. 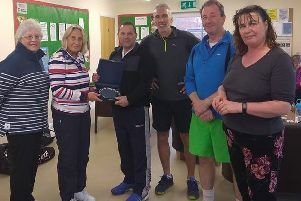 Fourteen sets of three payers challenged for the trophy with Waylon Clarke, Tony Codd and Wendy Pateman taking top honours by 53-52 points from Gill Annison, Peter Annison and Paul Roberts. The trophy was presented to the winning team by Eslaforde Park president John Dawson. Pictured from left, Tony Codd, Wendy Pateman and Waylon Clarke receive the winners’ trophy from club president John Dawson.